To view PDF files, you will need the Acrobat® Reader®. As FHWA works toward significantly reducing fatalities and serious injuries on all roadways, we are committed to comprehensively addressing rural road safety issues. We will continue to work closely with locally focused organizations and practitioners to develop tools and resources for these road owners so they have access to the road safety information, knowledge, and resources needed to address safety issues in their jurisdictions. It is imperative that local and rural highway practitioners routinely integrate safety into their projects and programs and several local agencies are making large strides in these areas. This edition of the Safety Compass is focused on local and rural road safety information and highlights some noteworthy practices occurring in select jurisdictions. In the last edition of the Safety Compass, we featured the updated guidance on Proven Safety Countermeasures, where modern roundabouts were described as one of the innovative intersection designs that significantly reduces fatal and injury crashes. In this edition, we will take a closer look at the safety benefits of modern roundabout in rural areas with high speed approaches. During 2009, 41 percent of all fatal motor vehicle crashes in the United States occurred on two-lane rural roads. Six percent of all these fatal crashes occurred at unsignalized intersections on rural two-lane roads (NHTSA, FARS). The difference in the speeds of vehicles at a rural intersection is often a major factor in the severity of rural intersection crashes (i.e., driver runs through a stop sign or traffic signal or misjudges the gap and pulls out in front of a vehicle traveling 55 mph on the through route). As transportation agencies seek countermeasures to improve safety at rural intersections, roundabouts can be a "game changing" intersection design that reduces the potential for injury crashes, provides overall intersection efficiency, and allows flexibility in the intersection layout. By design, roundabouts command a change in driver behavior with slower speeds for all traffic - whether in an urban or suburban environment with posted speeds of 35 mph or on a rural two-lane highway with a posted speed of 55 mph. Regardless of the location and speed limit, the average driver navigates roundabouts between 15 and 25 mph. Roundabouts also reduce the number of conflict points at an intersection, from the 32 at a traditional 4-legged intersection on two-lane roads down to 8, and change the types of crashes that occur, reducing the number of right angle crashes significantly. 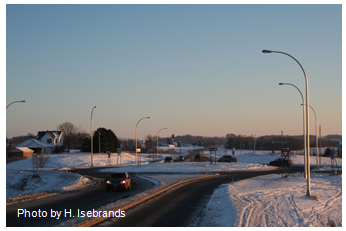 New research has expanded the safety data available for rural roundabouts with high speed approaches (Isebrands 2011, Isebrands Forth-coming 2013). Rural roundabouts significantly reduced total crashes by 62 to 67 percent and injury crashes by 85 to 88 percent at 19 rural roundabouts. In 2008, an average of 5 years after construction of the roundabout, no fatal crashes had been reported at these intersections, whereas 11 fatal crashes were reported during a similar time period when the intersections were two-way stop controlled. Moreover, the number of angle crashes, which tend to have a higher likelihood of causing injuries at high speeds, decreased by 83 percent. This research also included an approach speed data analysis on 10 rural roundabout approaches and 3 rural stop controlled approaches. Average approach speeds 100 ft from the roundabout yield line were 2.5 mph lower than average approach speeds 100 ft from the stop bar at two-way stop-controlled intersections, indicating that drivers are able to take the cues from the advanced signing and approach geometry to adjust their speeds before entering the intersection. The States of Maryland, Washington, and Kansas were all pioneers in constructing rural roundabouts with high-speed approaches, starting over a decade ago. Consistent and convincing safety experience at these early rural roundabouts have paved the way for other State DOTs and local governments to consider roundabouts on rural two-lane, high speed roadways It is estimated that nearly 50 rural roundabouts with high-speed approaches are in operation today across 15 states. And as that number increases, we expect fatal and injury crashes at those intersections to move towards zero. Isebrands, H. "Quantifying safety and speed data for rural roundabouts with high-speed approaches." Dissertation. Iowa State University. Ames, Iowa. 2011. By Jeffry C. Martins, RIDOT-Civil/Traffic Engineering; Sean Raymond, P.E., RIDOT – Senior Civil Engineer; Peter Pavao, P.E., PTOE, VHB– Safety & Operations Engineer; and Jacinda Russell, FHWA RI Division - Safety & Operations Engineer. In 2009 Rhode Island DOT (RIDOT) began refocusing its efforts in safety to ensure all safety funds were being used to implement improvements using a new program titled RI*STARS (Strategically Targeted Affordable Roadway Solutions). The RI*STARS Program was a "new" initiative and partnership between transportation planners, traffic engineers, safety engineers and operations staff. Can be included in upcoming projects (i.e., pavement preservation). Example of a rural road targeted by the RI STARS program. 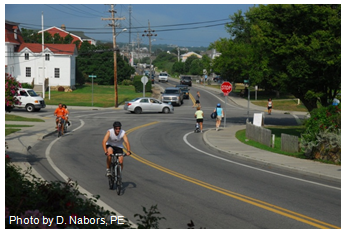 RIDOT completed the pilot of the RI*STARS program in Newport, Middletown, and Portsmouth (Aquidneck Island) in conjunction with a regional multimodal transportation planning study being completed by the Aquidneck Island Planning Commission (AIPC). The pilot consisted of 22 spot locations and 3 corridors with the greatest need for safety improvements and congestion reduction. A Road Safety Audit (RSA) was conducted at each site and was followed by the identification and implementation of countermeasures. In 2011, RIDOT expanded the RI*STARS program to have a subprogram focusing on rural roads. Crash data from 2008 – 2010 was compiled and more than 20 high-crash locations were identified on major and minor rural collectors and local rural roadways as being eligible for inclusion in the High Risk Rural Roads Program. RSAs were performed at a handful of sites that represented different types of roadway facilities. RIDOT also reviewed RSAs previously performed at some of these locations. Based on the crash data trends and the RSAs, the major issues RIDOT identified were roadway departure and unsignalized intersection crashes. Because of the dispersed nature of most of the serious or fatal crashes, RIDOT opted to use both targeted systemic and site-specific improvements for the rural collector and local roads. RIDOT developed systemic improvement criteria to help identify the improvements that could be implemented on each eligible roadway. Systemic improvements selected include rumble strips and stripes, roadside delineation, and enhanced signage and striping at horizontal curves and at unsignalized intersections. RIDOT also proposed left- and right-turn lanes at eligible rural collector intersections. The RSA process also identified site-specific improvements as well, including removing skewed intersections, reducing an unsignalized intersection footprint, and resurfacing horizontal curves with high friction treatments. Enhanced bicycle improvements along one corridor in a major tourist area are also proposed, including installing the SafetyEdgeSM, geo-reinforced shoulders, enhanced signing, and "Share The Lane" pavement markings. The first contract for the HRRR improvements is slated for award later this year. RIDOT is planning to invest $2.8 million in these safety improvements through the HRRR Program. Between 2000 and 2009, 7,959 people died on our Nation's dirt and gravel roads according to the FHWA's Fatal Accident Reporting System (FARS). During this same period, 8,554 people died in work zones. Despite these similar numbers, safety professionals put a lot more emphasis on making our work zones safer than we do on making our unpaved roads safer. Why? Motor grader's moldboard shaping the foreslope at about 3½:1. It shouldn't be any steeper. This alignment is dangerous since the clear zone is steep with trees on the outside of a downhill curve. Fortunately the surface is tightly bound with only minor washboards and loose aggregate. The answer may be in part that crash data collection is tailored to paved roads, whereas the factors contributing to crashes on unpaved roads frequently aren't well understood and often aren't the same as those for paved roads. Often factors such as loose surface aggregate or washboards (rhythmic corrugations) are not recorded when crash data is collected. Therefore, we don't know how many people die each year because their vehicles slide out of control due to a severely raveled surface. A compounding factor is that most gravel roads have too little traffic to provide us with statistical confidence about either crash locations or causes. This combination of obstacles makes it difficult to identify ways to save lives on these very low-volume, unpaved roads. Education, enforcement, and improved vehicle safety have all made unpaved roads safer. For example, the video titled Rural Road Crashes produced by the Iowa Traffic Safety Alliance is certainly helpful. Proactive efforts by law enforcement also help to lower speeds, reduce impaired driving, and increase seat belt usage. Improving vehicle safety also helps reduce both the consequences and the likelihood of crashes (although there may be problems with ABS brake systems on unpaved roads). But what can we do about those issues unique to unpaved roads? Two primary factors, the road's geometry and its surfacing material, are under the control of those responsible for road maintenance. Crown, shoulder, foreslope, and ditch geometry may change each time a road is re-worked with a motor grader. Though we don't have a good way to assess numerically the risks of loose aggregate, washboards, or fugitive dust, we can be confident that these all contribute to fatality crashes every year. But having good data will not address these problems; good maintenance practices that come from good training will. The more forgiving an unpaved road's geometry is, the safer it is. Crown (cross slope) should be about 4 percent to provide drainage, but it shouldn't be much steeper or drivers will be forced down the center of the road. Keeping in mind that vehicles on unpaved roads are likely to have stiffer suspensions and higher profiles, shoulder slopes and foreslopes should be a maximum of 4:1, with 6:1 or flatter being preferred so roadway departures don't overturn vehicles. Similarly, culvert ends and approaches should have a slope of 10:1 or flatter. As for any road, the wider, flatter, and less obstructed the clear zone is, the less likely a roadway departure is to result in a fatality. Giving errant vehicles a smooth transition to a ditch bottom where they can safely come to rest should be a goal of every motor grader operator responsible for maintaining unpaved roads. Good surfacing material is the other primary element of a safe, unpaved road surface. Loose aggregate can act like marbles, causing a driver to lose control of the vehicle. Poor quality aggregate can lead to excessive dust, which can obstruct a driver's view of the road and oncoming traffic, leading to severe head-on collisions. Washboards, too, can contribute to a loss of vehicle control, particularly on curves. Another dangerous consequence of washboards can be that they tempt drivers to travel too fast so tires skim the washboard crests, providing a smoother but more dangerous ride. Unfortunately these problems are often worst right where vehicles turn and brake, causing increased raveling, loose aggregate, and washboards where vehicle control is most critical. Well-graded, crushed surfacing aggregate with adequate binder will reduce raveling, dust, loose aggregate, and washboards, making our unpaved roads safer. Aggregate should be well-graded to provide a tight surface that resists water infiltration. The coarse material should be crushed, both to provide strength and to improve friction. Binder, the fine material passing a #200 [4.75 µm] sieve, should hold the coarser material together. In wetter climates, silt and very fine sand may work well as surface tension holds them together. In dry climates, the binder should have some plasticity so it holds together even in very dry conditions. Appropriate dust control and soil stabilization agents also help maintain a tight surface. Surfacing aggregate should provide a tight surface that resists raveling and maintains solid contact with tires, providing drivers with full control of their vehicles. 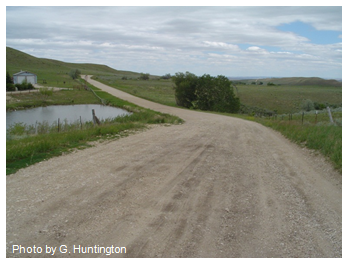 Two good sources for basic gravel roads safety training are the Minnesota LTAP video titled "Gravel Road Maintenance: Meeting the Challenge," and the Gravel Roads Maintenance and Design Manual by the South Dakota LTAP. Both of these items are available at http://www.mnltap.umn.edu/publications/videos/gravelroadmaintenance/. These resources de-scribe surfacing material properties that reduce loose aggregate, washboards, and dust. Surface geometry problems that may turn a minor roadway departure into a fatal crash or increase the likelihood of a head-on collision are also described. All unpaved road maintainers should familiarize themselves with gravel road safety issues. Just as for paved roads, we can't completely control drivers, but we can and should make the roads themselves as safe as practical by considering these geometric and material safety issues when we maintain and improve our unpaved roads. By Steven A. Buckley, P.E., State Highway Safety Engineer, KDOT. 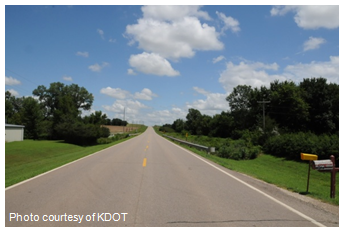 In 2010, the Kansas DOT (KDOT) performed a Road Safety Audit (RSA) on a county highway in Saline County, home of the City of Salina (population 46,180). The highway is typical of many throughout the State: two-lanes, an asphalt surface with little or no shoulder, and intersected by a gravel township road approximately every mile. A Road Safety Audit (RSA) is a formal safety performance examination of an existing or future road or intersection by an independent, multi-disciplinary team. It is a process that qualitatively estimates and reports on potential road safety issues and identifies opportunities for safety improvements. Using the RSA process, KDOT performed a detailed crash analysis, met with local officials, conducted a field review, collected necessary field data, developed recommendations, and prepared a final report. The RSA team included a representative from the Local Technical Assistance Program (LTAP), a former county engineer, two former State highway patrol troopers, two State traffic engineers, and a consultant. 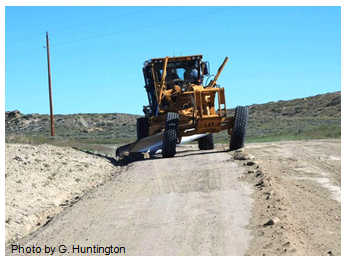 Several States are using their High Risk Rural Road Program (HRRRP) as a funding mecha-nism to implement improvements identified during an RSA, including Kansas. Funding for the Saline County RSA came in part from Federal and State safety dollars, and the resulting recommendations were eligible for High Risk Rural Road Program (HRRRP) funding. After the success of the RSA in Saline County, three more RSAs were performed during 2011: one each in Miami County, Montgomery County, and Ellis County. HRRRP funding was again used to implement RSA recommendations. Based on the success of these RSAs, KDOT continues to feed recommendations from RSAs into HRRR projects. To learn more about the RSA process and how it can be applied to improve rural road safety, please visit: http://safety.fhwa.dot.gov/rsa/. For more infor-mation on the Kansas RSA program, please contact Steven Buckley, State Highway Safety Engineer, at Buckley@ksdot.org. For more information on the Kansas High Risk Rural Roads Program and how RSA recommendations are funded using the HRRRP, please contact Lynn Berges, HRRRP Manager, at LBerges@ksdot.org. By Hilary Culbertson, National Center for Safe Routes to School. Established by SAFETEA-LU and administered by the Federal Highway Administration (FHWA), the Federal Safe Routes to School (SRTS) program provides funding to State DOTs for their ongoing efforts both to improve safety for child pedestrians and bicyclists (kindergarten through grade 8) and to encourage use of these modes for travel between home and school. Approximately 22 percent of schools participating in the Federal program are considered rural, making rural road safety for these school-age users an important focus of outreach and education efforts. Across the country, rural SRTS programs often face similar challenges, including a lack of existing bike and pedestrian infrastructure, a dispersed population, and community concerns about safety. However, these challenges are often met with strong local leadership, community partnerships, and strategic application of Federal SRTS funding to improve safety and access for rural walking and bicycling students. Often, pedestrian and bicycle infrastructure is incomplete or aging in rural areas, especially where the distances between destinations make non-motorized modes of transportation less practical. In New Hampshire, however, rural communities have relied on a combination of strategic infrastructure improvements and community leadership to further the goals of the SRTS program, according to John Corrigan, the State's SRTS coordinator. For instance, in Gorham, NH, Principal Karen Cloutier of Edward Fenn Elementary School noticed that the town had a network of sidewalks, but they didn't connect to the school. She applied for and was awarded SRTS funding that paid for a walkway that links the town's sidewalk to the entrance of the elementary school. She and a physical education teacher now lead "walking school buses" of their students from opposite ends of town in all seasons and all weather. 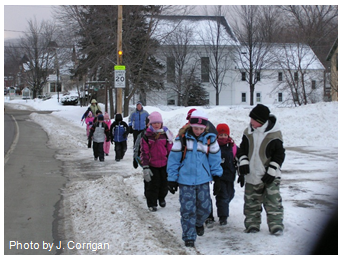 In Gorham, N.H., Principal Karen Cloutier chaperones a "walking school bus" of Edward Fenn Elementary School students. "If the school is open, the kids walk," said Corrigan. "In the snow belt, it takes a major storm to close the school." Like many of the older towns in the region, Littleton, NH had an extensive sidewalk network, although it had aged and was crumbling in places. In response, the town demonstrated its commitment to being a livable and walkable community by using SRTS and Transportation Enhancement funds to upgrade the walkways. One of the most significant challenges to a rural SRTS program is a small and dispersed population. For instance, in Putney, VT, a rural area with a town population of approximately 2,600 residents, most K-8 students who attend Putney Central School live a considerable distance from the school. This distance prevented children from walking or bicycling to school. With support from the Putney Central School Health Committee, the school's students and staff participated in several unique health-focused activities, including forest walks, a healthy snack program, and an organic gardening activity. A trained educator came to teach students about bicycle safety, and the school participated in Walk to School Day every year. In preparation to expand Walk to School Day into a weekly activity, the school learned that parents enjoyed driving their children to school in order to spend time with them and meet other parents and teachers. In response, Putney Central implemented weekly Family Walk to School Days. To make walking to school feasible for students and parents, the school arranged for the parents to park their cars at the town center, one mile south of the school. It even added a coffee hour for participating parents to encourage community building. Sometimes, the greatest challenge to implementing an effective SRTS program is parental concerns about child safety. At Longview Elementary School in Moses Lake, WA, residents were concerned about the safety challenges presented by the two main roads leading up to the school's entrance. In response, Safe Kids of Grant County and the Moses Lake Police Department worked together to improve safety conditions by providing trained crossing guards at the intersections in front of the school. The groups also worked to reduce the speed limit in the surrounding neighborhood during school hours, and, after applying for and receiving SRTS funding, the school was able to expand its SRTS education for students and fund the construction of a multi-use pathway and a sidewalk. Safe Routes to School programs are making it safer for students to walk and bicycle to school across the country. To read more about what SRTS programs have accomplished, visit www.saferoutesinfo.org/data-central/success-stories. Established in 2005 by the Federal Transportation Act, the University of Minnesota's Center for Excellence in Rural Safety (CERS) is designed to offer an array of tools and infor-mation resources to advance USDOT's strategy to increase safety on our Nation's rural roads. Sponsored in part by the Federal Highway Administration, CERS provides citizen-centered research, training, and outreach to enhance rural safety and to meet the online and seminar training needs of rural transportation practitioners and policymakers. The Center's mission is to facilitate training, research and educational ex-change in the areas of travel safety and choices, technology, economic development, citizen par-ticipation, and community development. The Local Safety Initiative (LSI) was created in 2004 by the Michigan Department of Transpor-tation (MDOT) for the purpose of assisting local agencies with locating and analyzing locations that have data supported traffic safety concerns. LSI is staffed by three full-time MDOT engineers. LSI taps into MDOT's traffic safety engineering expertise to provide local agen-cies with crash analysis and safety field reviews. RoadSoft, a GIS-based asset ma-nagement program developed by Michigan's Local Technical Assistance Program (LTAP, located at Michigan Technological University), uses local road data to identify intersections and corridors with the most critical safety concerns. Once the analysis is complete, it is sent to the local agency for review and a field review is then conducted with the agency. During the field review phase, low-cost countermeasures that may provide the greatest potential safety impact for each location are discussed as are possible funding sources. LSI provides safety engineering training for local agencies in two forms: by supplying safety resources (such as intersection safety strategies or vegetation control) to participa-ting agencies and by partnering with Michigan LTAP to provide a basic traffic and safety engineering class for local agencies. The LSI staff works directly with the LTAP in support of its efforts to refine and improve the RoadSoft program, and many LSI staff sug-gestions have been incorporated into the software, resulting in a safety module that is easier to use and more intuitive for users. LSI has assisted many different types of agencies in Michigan, from metropolitan agencies and large road commissions with several traffic engineers on staff to rural road commissions with an engineer-manager who shares many duties. The LSI staff recognize that, when performing crash analysis and providing safety suggestions for rural agencies, they will encounter different challenges than those faced by urban agencies. For example, lane departure crashes tend to be more heavily represented in rural settings. On urban roadways, intersections may be very close together, influencing the entire segment, whereas in rural settings, LSI staff engineers almost always gap out intersection crashes. As a result, intersections of interest are analyzed separately. In addition, because rural road agencies typically have a lower number of crashes, LSI staff engi-neers focus more on preventive crash measures rather than reactive measures. Systematic fixes also may be suggested for locations that have similar characteristics throughout the agency's jurisdiction (i.e., larger-size dual "Stop" and "Stop Ahead" signs to be placed at all intersections above a certain ADT threshold). According to a 2011 survey administered by LSI staff engineers, 85 percent of local agencies that participated in the LSI program were satisfied with the experience, and 70 percent felt that the suggestions provided by the LSI were useful and appropriate to their needs. LSI's work has improved the quality of proposals submitted for the safety call for projects through MDOT's Local Agency Programs safety funding and High Risk Rural Roads funding. Projects in the past also have been funded directly by LSI. LSI staff also has performed before- and after-crash studies for local agencies on a selective basis. To date, the LSI has worked with 17 Michigan cities and 78 percent of Michigan's 83 counties. LSI services are provided to local agencies free of charge and on a voluntary basis. Speeding is a major factor in motor vehicle traffic crashes. Exceeding the posted speed limit or driving too fast for conditions contributes to over 30 percent of all traffic crash fatalities. The Federal Highway Administration (FHWA) Office of Safety is committed to reducing speeding-related fatalities and serious injuries. As part of the efforts to assist States and locals to reduce speeding related crashes, FHWA has recently released USLIMITS2, a web based tool de-signed to help practitioners set credible and consistent speed limits for specific segments of roads. USLIMITS2 is applicable to all types of roads ranging from rural local roads and residential streets to urban freeways. The original USLIMITS was developed under a National Cooperative Highway Research Project in 2006. FHWA recently adopted the program with enhancements and made it available with user/customer support on the FHWA server at http://safety.fhwa.dot.gov/uslimits/. Users input factors including route type, section length, annual average daily traffic, 50th and 85th percentile speeds, statutory speed limit, and crash history, among others. They receive a recommended speed limit and a list of issues that might need to be further investigated. Users can save their project file and/or create Word and Excel versions of their reports. Access the USLIMITS2 tool at: http://safety.fhwa.dot.gov/uslimits/. To access other speed management tools and resources developed by the FHWA Office of Safety, or for more information on FHWA's speed management program, please visit http://safety.fhwa.dot.gov/speedmgt/ or contact Guan Xu (guan.xu@dot.gov, 202-366-5892). Program Planning, Development, and Evaluation – Programs that identify and address State and local needs by making effective use of safety data and evaluations. Additional details, instructions, and application packets are available at http://safety.fhwa.dot.gov or www.roadwaysafety.org. All nominations must be received by March 31, 2013 to be considered. The program is available to U.S. nominees only, including U.S. territories and funded operations such as District of Columbia, Puerto Rico, Guam, and the Mariana Islands. For more information, contact awards@roadwaysafety.org or (202) 857-1228. Registration is now open for the 16th annual Walk to School Day, which celebrates the many benefits of walking and bicycling to school. Walk to School Day 2012 will take place on Wednesday, October 3. Event registration is free and available to individuals and organizations holding an October event in the United States at http://www.walkbiketoschool.org/. Registering a Walk to School Day event provides organizers access to free, downloadable materials on the newly redesigned website, including stickers, certificates and customizable fliers. They can also easily create and share a walking or bicycling to school route via the new Map-a-Route tool available at http://www.walkbiketoschool.org/. International Walk to School Day is a global event that involves communities from more than 40 countries walking and biking to school. It began in 1997 as a one-day event. Over time, it has become part of a movement for year-round safe routes to school. Today, thousands of schools across America – from all 50 states, the District of Columbia and Puerto Rico – participate every October. For more information on Walk to School activities in the U.S., visit http://www.walkbiketoschool.org/. Vision: Toward zero deaths and serious injuries on the Nation's roadways. Promoting an integrated, multidisciplinary (4E's)1 approach to safety. Customers, Stakeholders, and Partners (external). 1 The "4E's" include engineering, education, enforcement, and emergency medical services. FHWA is pursuing many opportunities to further drive down fatalities and serious injuries on the Nation's roadways. To capitalize on these opportunities, the FHWA's safety units, comprising the Office of Safety, Office of Safety Research and Development, and the Resource Center Safety and Design Technical Services Team, collaborated to develop Safe Roads for a Safer Future – A Joint Safety Strategic Plan (SSP). The strategic planning process has brought these safety units together to focus on a common vision, and the plan itself ensures that each unit makes decisions that put all the units on a path toward the same set of goals. The safety units will use the SSP to identify and prioritize strategies, many of which will originate in existing roadmaps or in other program planning activities, to support the established goals. The safety units will also use this information when developing their Unit Performance Plans and individual performance plans. Teams within each safety unit and out among the field offices will carry out projects and activities to support identified strategies and achieve the SSP goals. The SSP doesn't just communicate safety priorities and commitments by providing input into the Safety Roadmaps and other planning tools, it also supports all four of FHWA's strategic goals in the areas of national leadership, program delivery, system performance, and corporate capacity (see the FHWA Strategic Plan at https://www.fhwa.dot.gov/policy/fhplan.cfm for more information). It does this through a vision, mission, and goals that complement and support FHWA's own strategic mission and goals. The SSP outlines a plan for advancing people and programs that will provide leadership and a level of excellence in technical execution that will move the Nation significantly closer to realizing the vision of zero deaths and injuries on our Nation's roadways. For more information on the SSP, how it fits into the overall USDOT and FHWA strategic planning process, and how it will be implemented to achieve the safety vision, please go to http://safety.fhwa.dot.gov/, where Safe Roads for a Safer Future - A Joint Safety Strategic Plan will be available beginning in late August for viewing or download. For more information about the SSP, please contact Chimai Ngo, chimai.ngo@dot.gov, 202-366-1231.